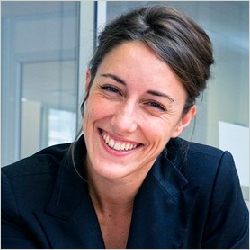 Gaëlle has more than 15 years of experience in the development finance industry. As Head of Agriculture Debt Investments at responsAbility, Gaëlle was responsible for the performance and contribution margin of agriculture funds and managing assets up to USD 250 million invested in more than 100 agricultural companies active in more than 50 countries and crops. Responsibilities also included the definition of overall agriculture debt investment strategy, global portfolio allocation, portfolio quality, business development, sourcing/origination, agriculture debt financing leadership and coordination. Before being appointed as Head of the business line, Gaëlle worked as an investment officer in charge of microfinance and agriculture investments in Latin America, Asia and Africa at responsAbility and for an investment advisor specialised in development finance. Prior to that, she worked as a consultant in Mexico, Senegal, and Argentina for an international microfinance holding company and for a program on access to finance or Max Havelaar France. She holds a master’s degree in Business and Administration from ESSCA and an executive master’s degree in Finance from ESSEC Business School in France.